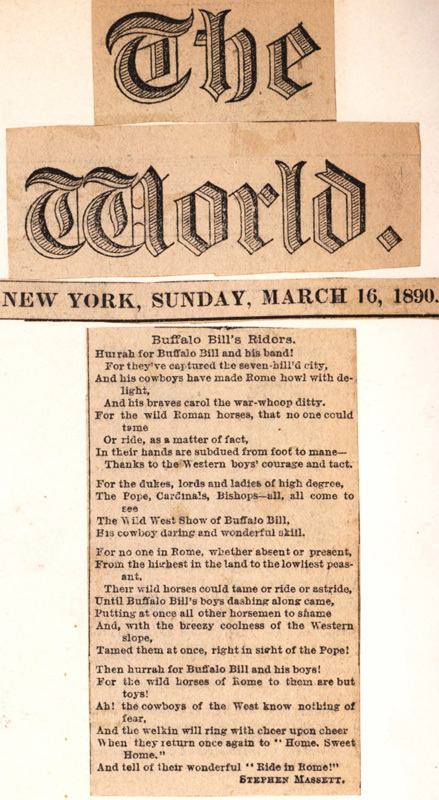 Hurrah for Buffalo Bill and his band! And his braves carol the war-whoop ditty. Thanks to the Western boys' courage and tact. The Wild West Show of Buffalo Bill. His cowboy daring and wonderful skill. Tamed them at once, right in sight of the Pope! Then hurrah for Buffalo Bill and his boys! For the wild horses of Rome to them are but toys! When they return once again to "Home, Sweet, Home." And tell of their wonderful "Ride in Rome!" People: Leo XIII, Pope, 1810-1903 Massett, Stephen C.